This post was written by Hatchet reporter Matt Cullen. It is tough to win on the road—against a ranked opponent that has won 14 games straight on its own court. It is even harder to win when three opposing players outscore your entire team. In fact, it is impossible. American University found that out Tuesday night. 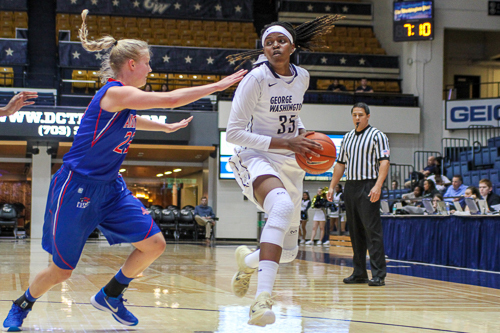 Junior forward Caira Washington led the Colonials with 21 points, sophomore forward Kelli Prange scored 18, and senior forward Jonquel Jones added 14 of her own. The frontcourt trio combined for 24 out of the team’s 45 rebounds in an impressive showing that led the Colonials (2-0) to a 78-48 win over the Eagles (0-2). “I was just getting to open space and constantly moving, one post player would flash high and dive right away when the ball [was] in, so I just kept moving and when I did that it created space for myself and my teammates,” Washington said. This type of performance has become the norm for Washington. She was selected as A-10 Player of the Week after her dominant game against Grambling State last Saturday (20 points, 8 rebounds). 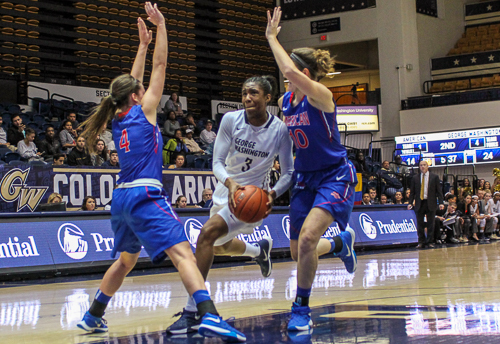 In the first couple possessions of the game it appeared that it would be a battle, American easily beat the GW press the first two times down the floor to get wide open layups and match the Colonials on the scoreboard, 4-4. The rest of the quarter was a very different story. The Colonials shot a solid 62.5 percent on field goals while holding the Eagles to only 26.7 percent. The press worked over and over as the aggressive GW defense was able to force 6 turnovers and several bad shots. This was enough to extend the Colonials lead to 24-8 at the end of the first quarter, including 12 points from Washington. Coach Tsipis has highlighted defense and, especially in the first half of the game, both senior guard Alexis Chandler and sophomore guard Bri Cummings stood out as the defensive anchors for the Colonials. The second quarter was slower for both teams. The Eagles were able to mount a small comeback after a bit of foul trouble for both Washington and Jones forced Tsipis to play a smaller lineup. The Colonials were not able to score for the first five minutes of the quarter but, with some good late play from Prange, they maintained their 16-point lead at the half. The game may not have been sealed at halftime, but the Colonials came out and made sure that it was out of reach before long. Highlighted by two three-point baskets by Jones and the consistent inside presence of Prange, GW had a 32-point lead by the end of the third quarter, and was not looking back. Jones ended up spending a good amount of time playing on the perimeter as opposed to her normal post game. She wen 2-6 from behind the arc, consistently drawing a defender in making plays for her teammates. Against the Colonials reserves, American had its highest scoring quarter in the fourth when they had almost no chance of winning. Senior forward Michelle Homes was able to get it going and netted 9 of her team-high 17 points in the final 10 minutes. Despite being up by 30, a couple miscommunications and turnovers had Tsipis visibly frustrated, barking at his players. After the game he said that he is looking for the team to keep its foot on the gas, no matter what is on the scoreboard. In the final minutes of play, senior forward DaLacy Anderson was the leader on the floor and her 7 points in 7 minutes helped GW cap off the win with an 11-1 run. Saturday the Colonials travel to Stanford, Calif. to take on the No. 15 Cardinal (2-0). That matchup kicks off a five-game road-trip before they take on Florida Gulf Coast (1-0) back at the Smith Center on Dec. 3.